90 years ago Tuesday January 15th 1929 Martin Luther King Jr. was born. At the age of 26 he became a key leader in the modern American Civil Rights Movement. He is well known for promoting non-violence. 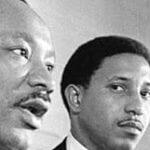 A way of life that Dr. Bernard LaFayette Jr., who worked with Dr. King, promotes to this day. While in the Seattle area last year with Project Pilgrimage, Dr. LaFayette sat down with 91 3’s Ruthie Bly in a restaurant and shared the difference between non-violence and equal justice. Dr. Bernard LaFayette worked closely with Dr. King and carries on his legacy today with Kingian Nonviolence training. He also chairs the board of another Dr. King legacy: the Southern Christian Leadership Conference.